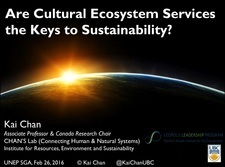 Are Cultural Ecosystem Services Key to Sustainability? In this session the SGA Network Secretariat are joined by Prof. Kai Chan (University of British Columbia) to explore the question 'Are Cultural Ecosystem Services Key to Sustainability?' Cultural ecosystem services’ (CES), long seen as the black sheep among the major classes of ecosystem services, have been gathering great momentum as a topic of study. Yet even still, CES are frequently seen as being of secondaryimportance in environmental protection efforts. Prof. Chan argues that instead that CES are an essential focus for sustainability and environmental protection, both because CES are crucial contributors to human well-being and because they are key to sustainable human-ecological relationships. This webinar reviews the history of research and thinking on CES and considers what such research might imply for the management of ecosystems and of the human-ecological relationships that are key to CES and to future trajectories for humanity on Earth. In light of competing notions of weak and strong sustainability, several propositions are advanced regarding appropriate management for CES and so all ES. Overall CES can be seen as a newly recognized kind of human-natural capital, and as capital-producing: not only do positive experiences and attachment with nature yield both well-being and key capacities, they also yield the stewardship attitudes and identities that may be fundamental to local and global sustainability. In this session the SGA Network Secretariat are joined by Dr Steve Fletcher (UNEP-WCMC) to deliver a session focusing on ‘The application of Ecosystem Services Assessment to Marine Protected Areas (MPAs)’. 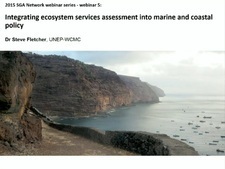 In particular the webinar explores two themes: 1) how ecosystem servicesassessment can be used to support decisions concerning the designation of an MPA; and 2) how ecosystem services assessment can support the identification and choice of management measures within MPAs. To provide context to these points, we focus on several worked examples. Dr Steve Fletcher delivers a session exploring the role of ecosystem services assessment (ESA) in marine and coastal policy. This includes an overview of why it can be beneficial to include ESA in marine and coastal policy making, how to conduct ESA in such a way as to support its uptake into policy (and management), and the relationship between ESA in stakeholder engagement in a marine context. These themes are explored using worked examples from a variety of recent projects. Alejandro and Augustin present their insights regarding the challenges of integrating ecosystem service assessments into policy. Concepts such as credibility, relevance, and legitimacy of ecosystem service assessments will be discussed as well as presenting the ValuES methods inventory and how it can be used. Courtney Price (Conservation of Arctic Flora and Fauna (CAFF)) partners with the SGAN Secretariat to present on “Actions for Arctic Biodiversity: implementing the Arctic Biodiversity Assessment”. Merging the worlds of science and policy, this webinar presentation by Courtney Price will describe the CAFF and Arctic Council process to develop actions from a regional assessment on biodiversity. Simone Maynard (Australian National University) partners the SGAN Secretariat to present on 'Developing information and tools (frameworks) for ecosystem service assessments'. This presentation draws upon local, national and global scale research and practical experience in developing frameworks to evidence why and how the process applied is more important than the final product produced! In conclusion, recommendations are provided for researchers to determine an appropriate process to develop a framework for ecosystem services assessments. The SGAN Secretariat partnered with Dr Roger Sayre to present and discuss the new global Ecological Land Units (ELU) map. The new global ELUs map and database were developed in response to the need, and an intergovernmental commission, for a high resolution and data-derived global ecosystem map. This map subdivides the Earth’s surface into relatively fine, ecological land areas and is designed to be useful for various types of ecosystem research and management applications, including assessments of climate change impacts to ecosystems, economic and non-economic valuation of ecosystem services, and conservation planning. The SGAN Secretariat partnered with Dr Benjamin Burkhard to present and discuss the different challenges related to ecosystem service (ES) quantification and mapping. Challenges include: the regularly occurring issues of problematic data acquisition; the distinction between potential ecosystem service supply, flows and demands; the correct delineation of service providing units (SPUs) and benefitting areas (SBAs), and their spatial relations and temporal scales. The SGAN Secretariat partnered with Ersin Esen to deliver an introduction to ProEcoServ, followed by examples, case studies and an outline of lessons learned from implementing the project. Providing a range of examples of how mainstreaming can be used at various scales, for different ecosystem services, and in different institutional contexts, ProEcoServ has the overall goal to integrate findings and tools of ecosystem service assessments into national and local policy and decision making. The SGAN Secretariat partnered with Dr Mark Mulligan to present short introductions on the Co$ting Nature and WaterWorld tools. This was followed by a demonstration on how to map current ecosystem service provision and impacts of projected business-as-usual, land use change, and conservation intervention scenarios. Speakers: Mr Gregg Verutes and Dr Adrian Vogl, NatCap Project. The SGAN Secretariat partnered with representatives of the NatCap Project to present a training session introducing the Natural Capital Approach, using examples from coastal Belize and Colombia. Additional preparation for the content of the webinar can be found at the NatCap online course. The SGAN Secretariat partnered with Carl Obst to deliver a training session on Natural Capital Accounting, drawing from his experience of preparing the UN System of Environmental-Economic Accounting (SEEA). The SEEA includes an international statistical standard covering all aspects of environmental-economic accounting at the national level and encompasses significant advances in describing ecosystem accounting. The SGAN Secretariat partnered with Jennifer Birch to deliver a training session on TESSA – a new ‘toolkit’ for measuring ecosystem services at the site scale. This toolkit is accessible to non-experts. It helps users with limited capacity (technical knowledge, time) and resources (money, ‘man’ power) to deliver scientifically robust information on ecosystem services.